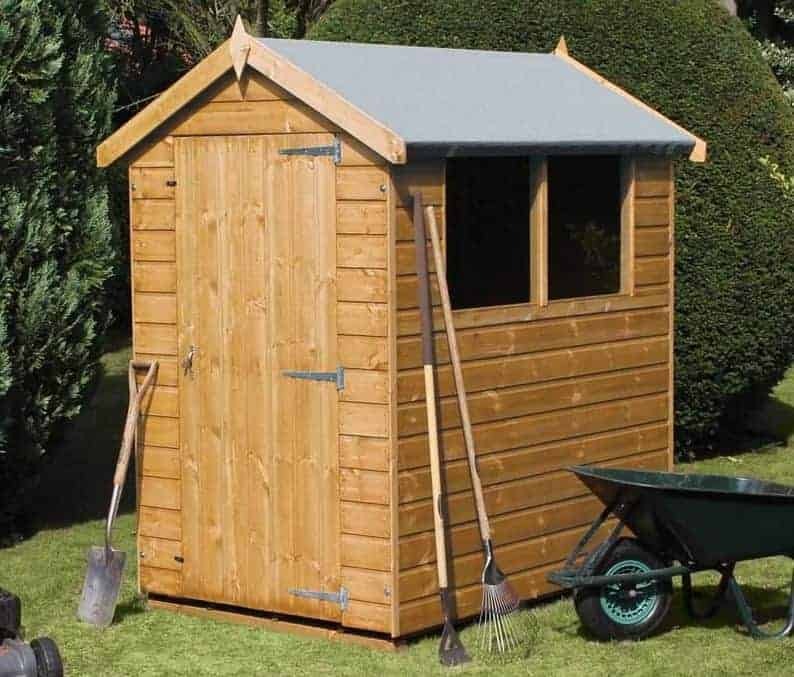 This immaculate shed is offered as part of the superb Treetops Traditional range. One of the signature features of this collection is the fact you can customise the doors and windows. It is constructed to an exceptionally high standard and is by far one of the best storage sheds available. 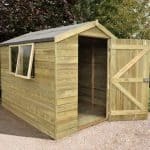 DEAL Redwood timber is used throughout, with tongue and groove construction featuring on the interior of the shed, as well as its exterior. No corners have been cut to produce this shed which means you are getting a durable, secure and sturdy building. As it comes with an apex roof, you benefit from great waterproof protection, as well as excellent internal height. This makes it ideal for storing those larger tools such as brooms, rakes and shovels. You could even keep your prized golf clubs or fishing poles in here safe in the knowledge that they will be fully secure. The door comes with a built in key operated lock. This really boosts security, making it difficult for thieves to get into. You can upgrade from a single to double doors and if privacy is a concern you can also chose a windowless design instead. The fixed windows that come with the shed are glazed with horticultural glass. Poor quality felt, though you can buy a better quality felt elsewhere to complete its high quality design. We’re a big fan of the Treetops Traditional Standard Apex sheds. Unlike most similar size buildings out there, there are no cost cutting tactics used throughout its construction. 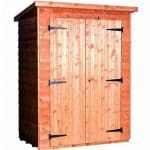 It is one of the toughest, highest quality storage sheds available and it is designed to store items of all sizes. The main measurement that always stands out to us with this range is the height. Even the door has a taller design than a lot of similar sheds. So if you’re a little on the taller side and you are worried about getting into the shed without bumping your head, this is a great choice. Another pretty impressive measurement is the door width. With most doors measuring 2’2” in width, this one offers a lot more space to access your storage. The apex roof is one of the most important design features of this shed. It ensures there is a huge amount of height in the building, whilst also draining rainwater quickly away from the shed. This 2-in-1 benefit gives it great value for money, as well as giving the building a more traditional look. It is built from tongue and groove cladding, just like the exterior walls. So compared to the majority of sheds out there, the roof on this one is definitely a lot stronger. The tongue and groove construction doesn’t just stop at the roof either. The floor also benefits from 12mm tongue and groove materials. What this means is not only can it hold heavyweight tools, but it is also a lot more solid to walk over, giving you better peace of mind. Like all sheds in the Treetops Traditional range, this one is built from unique DEAL Redwood and it is PAR 12mm finished. The use of redwood is fairly unique to this collection and it offers a different style in comparison to its competitors. The width of the Shiplap cladding is the same as other models and it offers a very strong, weatherproof design. What’s different about Shiplap compared to overlap is that it contains a channel between each plank which acts as a water drainage feature. This and the interlocking tongue and groove construction is what makes the cladding so superior. A 44mm x 27mm frame helps to make sure the interior is just as strong as the outer walls. It offers a more rigid structure, ensuring it isn’t damaged by daily wear and tear. It’s good to see that the walls are dip treated at the factory. This basically consists of each panel being dipped into a good quality preservative so that it is absorbed onto the surface. They are then left to dry before being shipped out. Whilst it does provide more protection than a basecoat treatment, you will need to apply another treatment roughly 6 weeks after installation and then continue the treatments each year. The doors and windows are where the Traditional Standard Apex Shed really stands out. It comes supplied with a single, wide door that is both triple hinged and braced for maximum stability. There is absolutely no chance that this door will sag through daily use. Although this door does offer a brilliant amount of access to the building, there is a double door upgrade available. These feature wider 4’ doors which will enable you to get even larger equipment into the shed. As for the windows, there are 3 fixed horticultural glass windows supplied which is slightly different to what is shown on the picture. However, just like with the door, there are customisation options available too. You can remove the windows entirely for a more private and secure building, or you can change them from fixed to opening windows. If you do want to upgrade them to opening windows however, it will cost you for each one you alter. One very impressive benefit of the windows is the little water drainage ledge underneath them. This isn’t something Shed Store advertise but it is a great additional feature that you don’t find on most other sheds on the market. The great news is you won’t have to spend any more money on securing the shed. It boasts a super impressive key operated lock and the cladding used makes it tough and thief-proof. 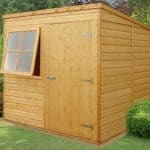 Security is a large part of this great range of sheds. As for privacy, you can choose just how private you need this shed to be. If your garden is fairly secure and not open to the public, the windows may not be an issue. You can also add some type of covering such as curtains if you are worried about people seeing into the shed. If you’d rather the shed didn’t come with any windows then you can request the windowless design for no extra cost. You have five additional options when buying this shed. Firstly let’s talk about the customisation options. As mentioned earlier, you can change both the windows and the doors on this shed. With the windows you have the option to change them from fixed to opening windows. Each one you choose to upgrade will cost you an additional £31.99. You can change just one or all of the windows depending upon your preference. Or if your garden isn’t very private, you may wish to remove the windows completely and opt for a windowless design. This won’t cost you anything extra and will leave you with a fully boarded shed. The door is the other thing you can customise. As sold, the shed arrives with a single door. However, for more access you can choose to upgrade to 4’ double doors. Not only will this give you more room to manoeuvre in and out of the shed, but it will also give it a slightly different look. As for the extras, you have two choices available. The first is floor bearers. These are really affordable yet they offer excellent protection against rot and fungus. If you build the shed directly onto the ground, in heavy downpours the floor could easily become damaged. The bearers literally lift the shed off the ground, preventing any exposure to the damp. An installation service is offered to those who don’t fancy putting the shed together themselves. This is a compact building but its ease of installation will largely depend upon the customisation options you choose. This could be a great service to invest in if you aren’t very skilled in DIY. Manufactured by one of the industry leaders, this shed offers the highest quality design. All of the materials used have been chosen for their exceptional standards. 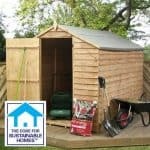 As only super quality materials have been used, the shed is guaranteed to last for a long time. The only reason we’ve given it 9/10 is because you do need to treat the timber annually to keep it fully weather resistant. The amount of space you have is slightly different to the shed shown in the picture. That is the 8’x6’ model so with this one it obviously isn’t as spacious. However, it will comfortably store all gardening essentials and is particularly well suited to small gardens. This shed is designed so that it goes together really easily. It’s going to take approximately 2-4 hours to assemble, but full instructions are provided. 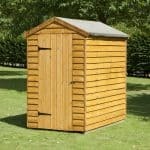 This is by far one of the most durable, high quality sheds on the market and it offers impressive value for money. Final Thoughts: This 7’x5’ storage shed offers exceptional quality and an array of brilliant features. Its walls have been dip treated prior to delivery, though an additional treatment will need to be applied within around 6 weeks after installation. 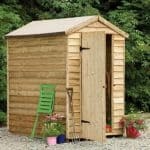 With a complete tongue and groove construction, this apex shed is capable of storing tools and equipment of any weight. The stand out benefit of this shed however is the customisation options presented to you. You can alter both the windows and the door to create a design that perfectly fits your requirements. It provides awesome value for money and is guaranteed to last for many years.